1. What’re Titanium Strips, Coils and Foils? Titanium grade 2 strip coil, made to ASTM B265, 0.60 mm(thickness) x 1000 mm (width), annealed. Any titanium product with thickness ≤ 4.75 mm and width < 610 mm is classified as titanium strip. Titanium foils are often much thinner than strips, usually ranging from 0.01 mm to 0.10 mm in thickness. Both strips and foils may be packaged into coils, that’s where we get the terminology “titanium coil“. The materials may be manufactured by hot-rolling or cold-rolling processes. 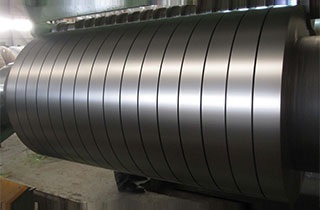 Generally, titanium strips, foils and coils shall be furnished in annealed condition, however, in some instances, they may be furnished in as-rolled or cold worked condition with or without trimmed edge. Especially, cold rolled titanium strip coils may be furnished 0.30~4.75 mm in thickness and 500~1500 mm in width. *The conventional manufacture processes, delivery conditions and size ranges for titanium trips and foils (coils). *The annealed condition is mostly preferred. *Custom-designed widths may be furnished upon request: for hot rolled coils, 1000~1500 mm; for cold rolled coils, 1000~1320 mm. 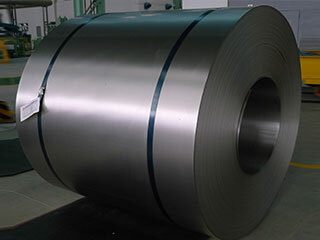 Titanium strips (foils, coils) are usually manufactured in accordance with ASTM B265/ ASME SB-265. There are also some equivalent standards including AMS 4900~4902, AMS 4905~4919, SAE MAM 2242, MIL-T-9046 (Military), ASTM F67/ F136 (Surgical implants), JIS H4600 & TIS 7912 (Japanese), D 5577 (South Korean), EN 2517/ EN 2525~EN 2528 (European), DIN 17860 (German), AIR 9182 (French), British Standards, GB/T 26723/ GB/T 3621-3622 (Chinese). ASTM B265 titanium grade 5 strip coils which are slit into smaller widths, 35 mm(width) x 0.5 mm(thickness), cold rolled, vacuum annealed. A comprehensive range of titanium and titanium alloys can be used for the manufacture of titanium strips and foils including titanium grade 1, grade 2, grade 3, grade 4, grade 5, grade 7, grade 9, grade 11, grade 12, grade 16, grade 17, grade 23. Among all grades, titanium grade 1, 2, 3, 4 are unalloyed titanium, also known as commercially pure titanium. Both titanium grade 5 and 23 have the same nominal composition Ti-6Al-4V except that grade 23 has extra low interstitial elements(ELI). The nominal composition of grade 9 is Ti-3Al-2.5V. Grades 7, 11, 16, 17 are typical titanium-palladium alloys. The nominal composition of grade 12 is Ti-0.3Mo-0.8Ni. Besides, strips and foils of unalloyed titanium grades 1~4 find its use in surgical implant applications according to ASTM F67. Meanwhile, ASTM F136 specified Ti-6Al-4V ELI(Gr.23) alloy as the medical material. *titanium content in each grade: the balance. *Maximum each of other elements: 0.1%; Maximum total of other elements: 0.4%. *T equals the thickness of the bend test specimen. Illustration of production flow chart for titanium strip coils. 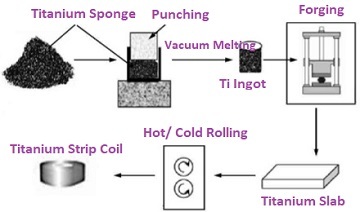 As illustrated in above flow chart, titanium sponges are prepared and pressed into an electrode for vacuum arc melting. Remelting is often required to ensure the quality of titanium ingots. The ingot shall be descaled and forged to obtain proper titanium slabs for subsequent rolling processes. After blooming of the slab, hot rolling process is performed to roll the material to 2~4.5 mm in thickness strips. The hot rolled titanium strips shall be annealed, shot-blasted and pickled. Precise grinding shall be performed prior to any cold-rolling process. Multiple-passes of cold rolling are performed to obtain thin titanium strips or foils such as 0.5 mm, 0.6 mm, 0.7 mm, 0.05 mm and 0.08 mm, in thickness. The cold-rolled titanium strips or foils shall be vacuum annealed or annealed in inert gas atmosphere. *The tolerances(permissible variations) for widths of titanium strips. *The tolerances(permissible variations) for thicknesses of titanium trips. *The tolerances(permissible variations) for lengths of titanium trips. *The tolerances(permissible variations) for widths, thicknesses, and lengths of titanium foils. Titanium strips are widely used for the manufacture of heat exchanger welded tubes, which are primarily applied in coastal power plants. They can also be used as clad metals in corrosion resistant applications. Titanium foils can be used for surgical implant field as well as the hi-fi equipment. The titanium strips, foils, and coils we supply and stock are sourced from prestigious mills in China including BaoTi, WTT, BaoSteel, and AnSteel. Third party inspection performed by BV, DNV, GL, Lloyd’s, or ABS is available to ensure the quality of the material.